Use 360 Solutions’ P60 Personality Assessment to make sure you hire right the first time. Learn more about yourself. Build teams that are meant to work together. Are you sure your new hire is a good fit? How do you measure the impact of development on an organization? Everything starts with a assessing both the organization and employees. This helps us custom tailor a solution with measurable results. The personality assessment we’ve put together is called the P60. It tells you things like: Are you a born leader? A supporter? A networker? It’s 60 questions long and can take as little as 5 minutes to complete. How do you know the person you're interviewing is the right person for the job? Adding personality assessments to your suite of hiring tools can help you hire right the first time. Produce a comprehensive personality report for each potential hire using our proven system. Recommend candidates with more confidence by adding personality assessments to your toolbox. Run P60s for every potential candidate and keep comprehensive records to provide to your customers. The best leaders in the world start by learning about themselves. 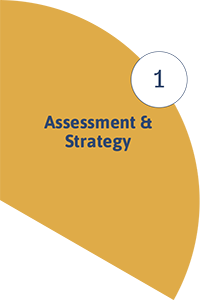 Use our assessment tools to learn more about your own strengths and weakness. Use the P60 with your team as the foundation for leadership development exercises. Our flagship P60 personality assessment is the fastest, most cost effective way of learning about someone’s personality type, but that’s just the beginning. Our suite of assessment tools can help you find the best hire in many different ways. The flagship assessment of our platform. Once finished, our custom report provides 8-18 pages of an applicant’s character and talent traits along with what you might expect from them on the job. It helps clients find where an applicant might best fit in a company. It will also show where you may need to offer direction and training. Hiring right the first time can save an organization significant time and money. A customizable multiple-choice quiz that can be tailored to any industry or business. Create an unlimited amount of questions with five possible answers. Upload pictures to use as visual aids. Assign a point value to make some questions more valuable than others. See how well an applicant can reason and solve questions in a timed session. Determine the basic skills of new and existing project managers, or assess project managers who are being considered for additional responsibilities. Use group-based opinions to evaluate the overall engagement of employees. Using general questions, create a survey for designated groups to receive anonymous results and comments. Solve math and spelling questions in a timed format. Used for assessing an individual’s baseline competence. Measures applicants in 11 sales-related areas. Gives insight into their personal sales style and where they might need additional training. How much do bad hiring decisions cost organizations? Amount employers spend to replace a senior executive. Poor hires can equal 30% of that hire’s first-year salary. Get immediate feedback into your personality style by taking a P60 Assessment, completely free. We’ll get back to you immediately with a report full of actionable advice you can use today. How do you see yourself using your assessments? Strategic Partners aren’t out there on their own. They’re a part of a community of like-minded entrepreneurs across the globe. Officially, we meet several times a year for training and networking. Unofficially, partners get together to work on projects, bounce ideas off each other, or just have a few cold ones. Being a sole proprietor doesn’t have to be lonley. Weekly mastermind calls with Chip and other SPs to talk about improving your business. See if you're a good fit for our company. Schedule a call with us to talk about your particular circumstance. Our system doesn't work for everyone. Some people aren't up for being a 360 Solutions Strategic Partner. We hate that, but it's best to know early. Come try out our system first-hand. We host Academies several times a year to learn how to start, build, and run a successful consulting practice. Come hear how our system works. We're strong believers in trying something before you buy. Come kick the tires. Start off on the right foot. We help plan your official launch. We've helped numerous partners start their own firms, so we know all the tips and tricks. Our global community of partners comes around you to make sure everything goes off without a hitch. Now that you're open for business, how do you find customers? We help you refine your marketing strategy. There's way too much content to learn in one Academy, which is why our online Faculty Dashboard has hours of training videos. Improvement only comes after knowing yourself. The P60 personality assessment is a foundational tool all of our Strategic Partners use when evaluating employees in an organization. Make it a part of your consulting services or resell it to organizations with high turnover. Use it as a way to offer value to a prospective clients. Host workshops for organizations and individuals to learn how to transform their from traditional to High Performance. These can be limited one-time engagements or regular training programs. Bring small numbers of business leaders or employees together as a Mastermind Group. Use the 360 Solutions curriculum as a jumping off point and let the power of collective experience improve interaction and retention of key leadership principles. Many Strategic Partners are sought-after public speakers. Any one of our programs can make a great keynote speech. Speaking engagements enhance your visual expertise. Co-author a book with our founder, Chip Wilson, to further increase your reputation as a thought leader. Work with organizations and clients in their facilities for interactive, hands-on development. This is the preferred method for implementing the High Performance Leadership Framework. Use our professionally produced workbooks to facilitate, or have your class use our High Performance Leadership iPad app. Help organizations improve their performance by identifying existing organizational problems, and develop plans for improvement. Typically, organizations seek out consultants’ specialized expertise for a variety of reasons. Executive coaching facilitates professional and personal development towards specific goals. Take employees out of the day-to-day work environment for a retreat. Studies show employees are more engaged when out of their normal surroundings. Solid teams are the foundation of High Performance Organizations, and developing those teams takes serious effort and consistent discipline. Team development requires hard work but is extremely rewarding for those willing to pay the price. 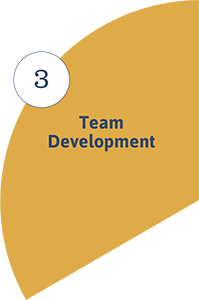 360 Solutions builds groups into High Performing teams by helping them develop each of the fundamental building blocks of a solid team, one step at a time. When working with organizations, 360 Solutions assesses both the organization and the individual. Just like a doctor diagnosing an illness, you first have to understand the problem before fixing it. Diagnosis comes before development of plans to improve the organizations’ health. Results are used to set a baseline for later comparison and to measure progress. Organizations can only survive if they maintain harmony with their external environment. This includes listening to customers’ needs, understanding changes in technology, knowing the competition, and understanding legal, social, and political climates. Strategy is a set of decisions that explain how an organization adds value to its customers and distinguishes itself from competitors. A well-developed strategy tells the organization where it’s going, like a rudder in a stormy sea. A core process is the major flow of work through an organization. Sometimes called the value chain, it is the sequence of events or steps performed by the organization to achieve its strategy and provide products and services to customers. When it is aligned with the strategy, all other business activity should support its accomplishment. Understanding, streamlining and properly supporting the core business process is the central job of any organization. 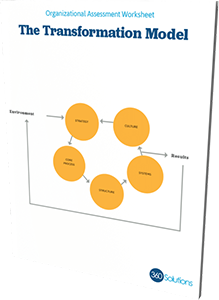 How people are organized around business processes. It’s not just the org. chart. Structure defines roles and responsibilities inside an organization. Does it help or hinder performance? The interrelated sets of tasks or activities that help the organization coordinate work. They are usually standardized. The most effective systems are often the simplest. Culture is how the organization really operates. It includes leadership style, worker attitudes and habits, and management practices and beliefs which make up the distinctive “personality” of the organization. It is like the air that permeates everything and is both the source and outcome of organizational behavior. Culture mirrors the true philosophy and values of the organization — the ones people actually practice. As such, it is a measure of how well the organization has translated its philosophy (organization strategy) into action. How is the organization performing? Results show an organization’s strengths and weaknesses. It’s important to be clear about expected future results. Leaders drive success by setting goals and monitoring results. They scan the environment, define vision and strategy, and design the infrastructure to make it all work. Successful leaders are the head of an empowered, independent workforce. Improvement only comes after knowing yourself. The P60 Personality Assessment is a foundation tool all of our Strategic Partners use when evaluating employees in a organization. Normally valued at $50+ per assessment, we invite you to take it absolutely free. We’ll send your our detailed report as soon as you finish. Understand the challenges and opportunities present in the external environment. Clarify a vision that inspires and motivates. Identify principles of conduct in the organization. Define future customers and how to deliver value to them. Identify core competencies needed to succeed. Create a long-term focus that anchors and distinguishes them from competitors. Establish performance initiatives and a master plan to manage long-term development. As organizations prepare to compete in today’s ever-changing and challenging environment, they understand leadership is the most important theme in business training. Take a moment to think about the word “leadership.” What does it mean to you? For our company, it’s a rich and significant word. It stirs up a sense of idealism, excitement, hope, and courage — a word that inspires us to be our best. We normally associate leadership with the most influential people in history. However, it also conjurs up memories of family members, teachers, coaches, and mentors who influenced us to reach our full potential. Understanding the five practices of the world's greatest leaders. Creating a clear and compelling vision of the future. Finding an appropriate balance between the five major leadership roles (technician, manager, trailblazer, architect, and coach). Empowering others to bring out their best. Leaders have the power to make things happen and influence the organization. Leaders are responsible for all of the factors (understanding customers and markets, developing a strategy, etc.). Leaders provide the vision, inspiration, and direction to attract and motivate others to success. Leaders create the infrastructure that helps an organization succeed. Get Chip's Book For Free! Fill out the form below and we’ll send you Chip’s book for FREE. Also, as a free gift, we’ll send you the first chapter of his book digitally. We hate spam. We promise to protect your address.